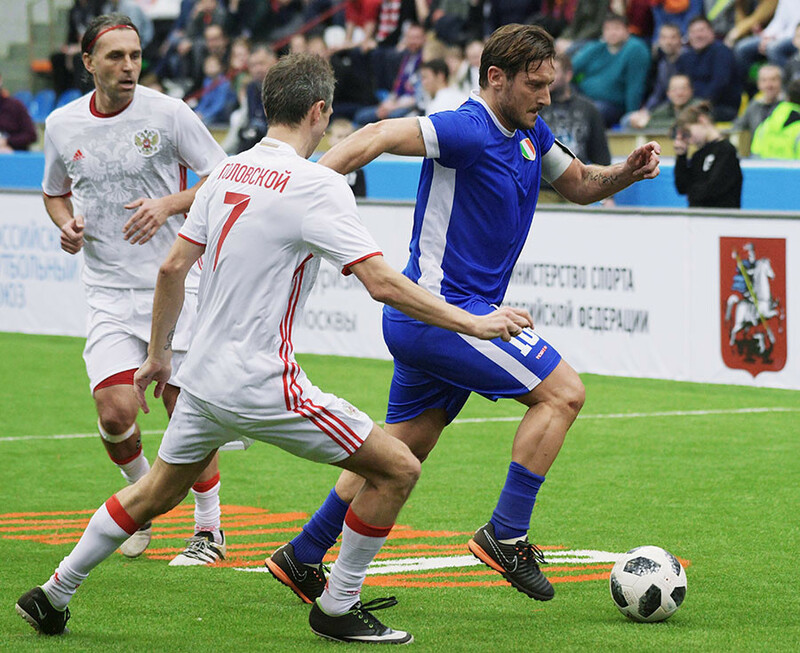 Moscow again played host to footballing royalty at the weekend, when Italian football icon and 2006 World Cup winner Francesco Totti visited the Russian capital to play in the annual Legends Cup tournament. AS Roma idol Totti arrived with a team of Italian legends - including Dino Baggio and ex-Roma teammate Marco Delvecchio - for the 10th anniversary Legends Cup at Moscow’s Malaya Sportivnaya Arena, located just a stone’s throw from Luzhniki Stadium, which will host the World Cup opening game on June 14. Nicknamed ‘Il Capitano’ (the Captain) by the Italian press during his tenure with AS Roma, Totti once again took the captain’s armband to lead his side against selections of veterans from Germany, France, Portugal, Russia and a team of World Stars. The six-a-side tournament is dedicated to the memory of former futsal great Konstantin Yeryomenko, who tragically lost his life after suffering a heart attack on the pitch aged just 39. Totti retired from football just last year, bidding a tearful farewell to Roma at the end of last season - his 25th with the club. Totti spent 29 years from boyhood to retirement at ‘I Giallorossi,’ his local club, leading them to ‘scudetto’ glory in 2001 and winning two Italian cups. Although loyal to the yellow and red of Roma, Totti’s finest moment in football came in the royal blue of his national side, when he lifted the 2006 World Cup trophy as ‘Gli Azzurri’ beat France on penalties at Olympiastadion in Berlin. Over the weekend, the icon of Italy’s proud capital Rome arrived in the Russian capital, where the city is in the midst of a World Cup year, 12 years after Totti himself won football’s biggest prize. Despite only hanging up his professional boots last summer, Totti couldn’t save his countrymen from going down 8-5 to a Dmitry Alenichev-led Russia, however, with the hosts having raced into a 7-1 lead by half time. Russia carried their form all the way through their home tournament, beating Portugal 8-4 in the final. Impressive displays from Roman Pavlyuchenko, Alexey Smertin, Alenichev and the tournament’s best player, Evgeni Aldonin, drove the team to victory unbeaten, much to the delight of the partisan Moscow crowd. Will Russia be victorious in another home tournament - the 2018 World Cup - this summer? Only time will tell.